Once summer hits, most teens think of swimming pools, or the mall, or summer camp. 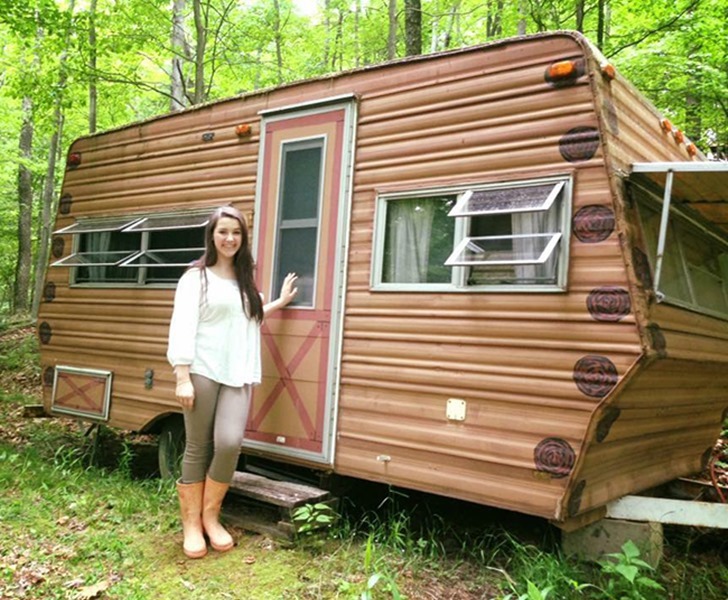 14 year-old Ellie Yeater of Williamstown, WV, had larger aspirations for her summer break: using her time to totally make-over a 1974 Wilderness camper. Ellie transformed an old camper into her very own glamper. Though still rustic in style, Ellie managed to create a dreamy, relaxing camping space that has retro flair to spare, with some help from her family and an eco-savvy approach. 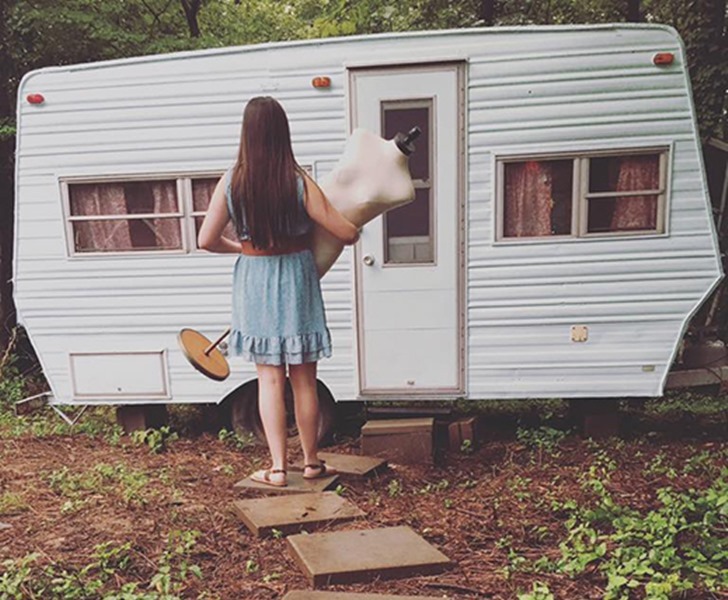 Though she’s young, Ellie, shown above, had the maturity to impressively save up $500 worth of birthday and chore money in order to purchase the camper, which she found through a local buy-sell-trade publication for a cool $200. 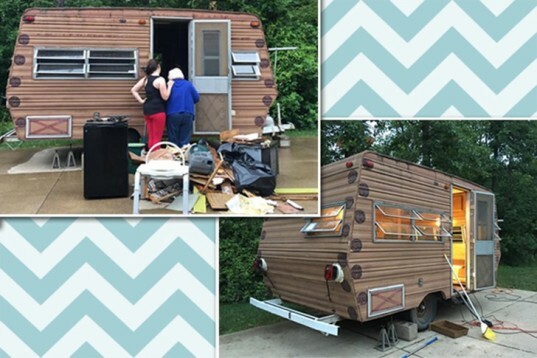 Ellie used the rest of her saved funds to buy paint, fabric, flooring and other goods for her renovation. Her father Larry kicked in a bit of extra cash to help buy wood and some roofing materials. The camper, at a price of only $200, as you might imagine, was in rough shape. 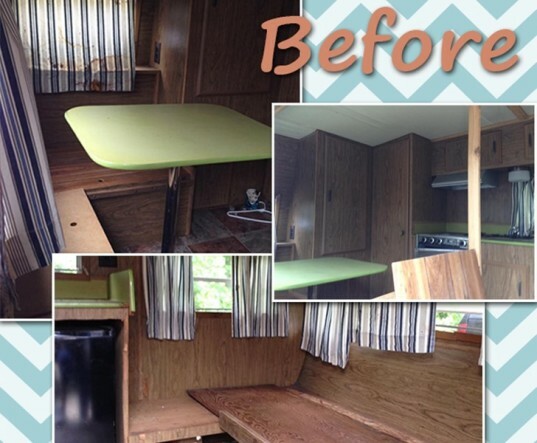 Before starting on the fun renovations, the entire camper, used previously as a campsite and hunting camper, had to be gutted, repaired and cleaned up. Ellie had some distinct ideas going into this project, including the actual renovations, plus the ability to have electricity and Wi-Fi. 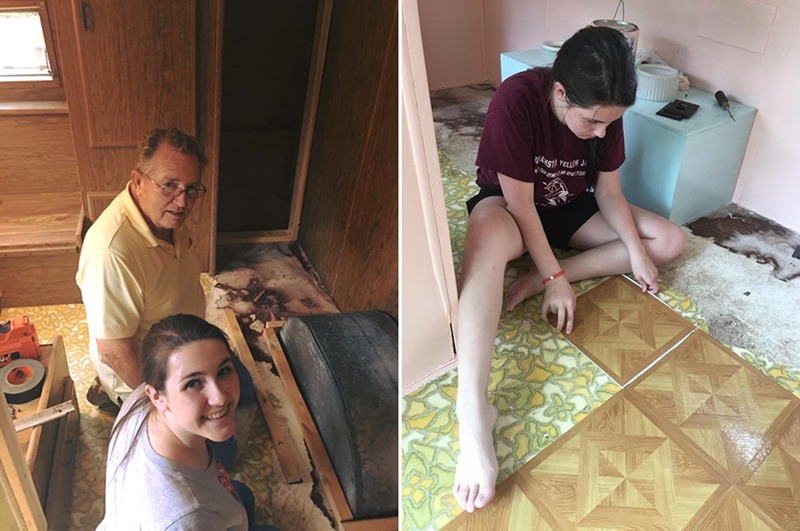 While the camper was Ellie’s baby, and she took on major projects, such as laying out floor tiles herself, her family did lend a hand. Above she’s shown learning some carpentry skills from her grandfather Lawrence as he helped her brace everything and plug holes. 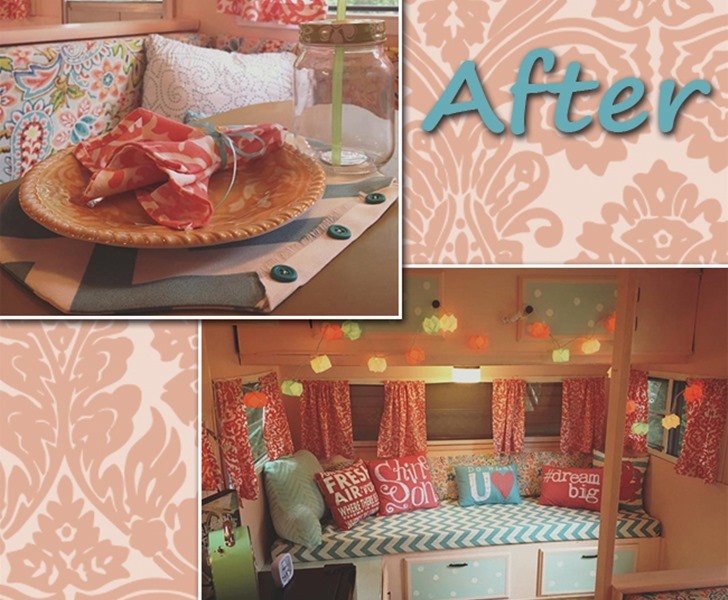 Ellie decided on a fresh peachy, aqua blue color scheme and used the painting scheme throughout the entire interior of the camper. Ellie’s Grandma Mary and her mother helped out by recovering the upholstery for the seat cushions and made curtains for the camper. During the renovation process, Ellie collected various items for camper decor from local shops, thrift stores and warehouse sellouts. 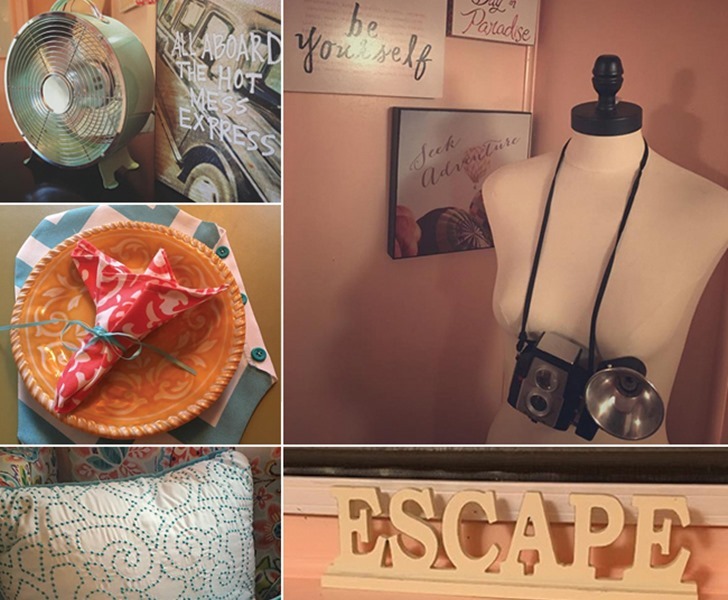 Ellie’s decorating style has a distinct vintage-reuse theme, including little touches like the vintage camera on an old mannequin, retro electric fan, and coordinating placemats/napkins made by her grandmother. 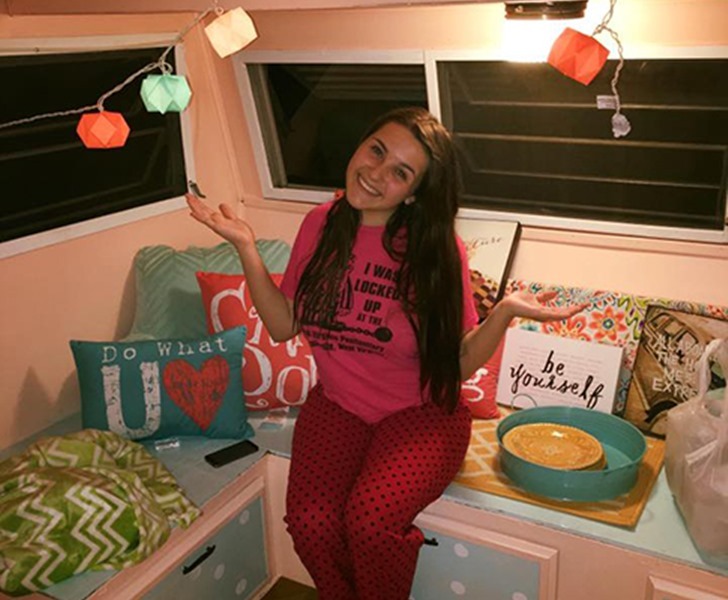 With the camper almost 100% complete, Ellie is ready to have friends over for sleepovers, but is still hoping to add some extras such as air-conditioning as she saves up more cash in her camper renovation budget. That said, the end result, air conditioning or not, is as impressive as it gets for such a young teen and hopefully an inspiration to other youth who might like to take on such a large project. Though she's young, Ellie, shown above, had the maturity to impressively save up $500 worth of birthday and chore money in order to purchase the camper, which she found through a local buy-sell-trade publication for a cool $200. 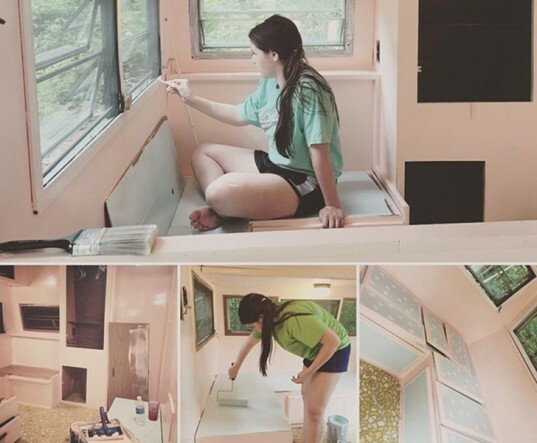 Ellie used the rest of her saved funds to buy paint, fabric, flooring and other goods for her renovation. Her father Larry kicked in a bit of extra cash to help buy wood and some roofing materials. While the camper was Ellie's baby, and she took on major projects, such as laying out floor tiles herself, her family did lend a hand. Above she's shown learning some carpentry skills from her grandfather Lawrence as he helped her brace everything and plug holes.